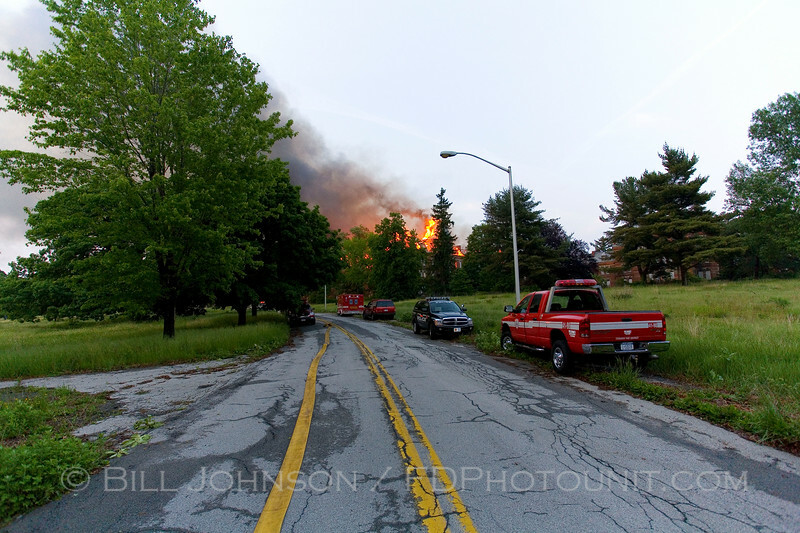 Numerous photos of a fire that occurred Hudson River Psychiatric Center located in the Town of Poughkeepsie N.Y. - Fairview Fire District. The fire began around 7:00 P.M. on May 31, 2007 and crews remained on the scene for days wetting down hot spots and picking up hose. The official cause has been determined to be from a lightning strike from a severe storm that passed through the area just prior to the fires discovery. By FDNY standards (1 alarm = 2 engines and a truck), this was the equivalent of a 6+ Alarm fire and it is the first incident that I have ever been to that 6 elevated master streams were in operation at once and when I left some 7-1/2 hrs later, I could see flames in my rearview mirror as I left the scene. The firefighters were faced with significant challenges upon their arrival. First was the sheer size of the building(s) involved, secondly was that the buildings were attached to each other making for a huge exposure problem as well as a maze to navigate (It took me 20 minutes to walk from the front to the rear of the fire building), and lastly was that the sites hydrant system was taken out of service. With no functioning hydrant system, firefighters were forced to lay several miles of large diameter 5" hose to supply the needed water to battle the fire. Heavy fire as I approached the building. The smoke was visible for miles and the people on the Ulster county side of the Hudson could easily see the flames licking the sky. Wow - when did this happen? The description says the fire started at 7:00 PM but it doesn't provide the date. I'm originally from Pok and now live in N.C. (but in fact I'm commenting from Las Vegas (family vacation)) - hence I'm oblivious to this event. Was this arson? I recall these beautiful/stately buildings well. They are really a large piece of Poks history.